8580 in 6581 Commodore 64? 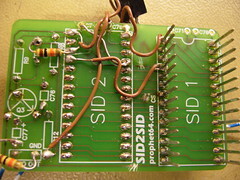 Right now I’m doing a hack to fit a 8580 SID as the second SID in a SID2SID, in a C64 designed for a 6581 SID. 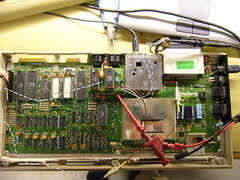 The the 6581 uses 12 V power and the 8580 uses 9 V power. So I had to put a regulator to regulate the 12 V down to 9 V. However, I didn’t find a 7809 (9 V linear regulator) so I’m using a 7808 instead. While that won’t fry the chip, the chip may not work because the voltage is too low. I’ll be back soon to tell you the result. I don’t have a camera, and Veqtor who was too faint at heart (Alternatively just tired) went home. So don’t expect any pictures until at least tomorrow. That’s all for now. Back in a few minutes. 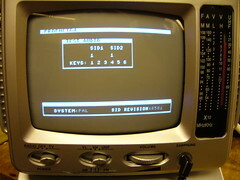 Update 1: I inserted the SID2SID board into the C64, and turned it on. At first I just got a blank screen but soon realized that I had forgotten to connect the CS wire. After doing that Prophet64 started fine. the 8580 didn’t catch fire, emit smoke or heat abnormally. 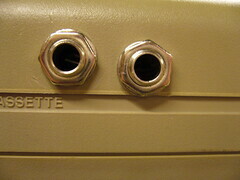 Test mode reports 6581, which is my main chip, as mentioned. I have yet to check whether it correctly outputs sound. Back with an update soon. 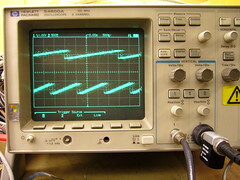 Update 2: I hooked up the sound output of the secondary SID to an oscilloscope, and… Nothing! There was no signal, nothing. I can think of several things that might’ve gone wrong. 8.13 V (That’s what I measured the output from regulator to be) might be too low. I might’ve done something wrong with the VCC connection. (At first I cut the VCC cupper path when I meant to cut the VDD path) I might’ve got the transistor wrong. (I chose another type because I didn’t find any 2n2222) The filter caps are the ones meant for a 6581. (Although that shouldn’t hurt the chip, just offset the filter frequency) Or I might’ve just burned a perfectly good 8580R5. I will do tests to eliminate these possibilities and report. I put the 8580 back in its home computer, and it’s not fried. When doing so, I measured VDD to 9.25 V.
I put the 8580 back to the SID2SID, put it back in the 6581 C64, and measured the output from the out pin. The result was a perfectly fine sawtooth waveform, that changed as I changed the test properties. In other words, the mod works, and did so from the start. The problem is, in other words somewhere in the post-SID amplification circuit, and in other words, the 8580 works as it’s supposed to. It generated some heat, but so did the 6581 as well as other IC’s on the mainboard, so I don’t think this a cause for concern. I’ve finally decided to make it happen. I have a C64 (Breadbox) that I haven’t been using much, mostly due to the lack of a diskette drive, and in turn software. Doesn’t that just look fabulous? However, myself, I’m planning to paint upper part pink, and the lower, probably black. Ugly you may think, but I think it’ll look… fresh in some way. 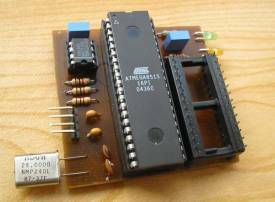 I also found this project, SwinSID which is a somewhat compatible SID clone, which I think sounds pretty good. A perfect combination would be to have one SID (To get the raw rough sound) and one SwinSID (To get some smooth wave forms) one a SID2SID. 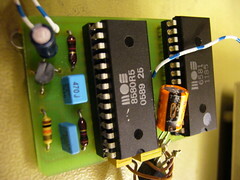 (A little cirucit board that lets you use two SIDs in one C64) I just wonder if SwinSID will work with SID2SID. I have yet to find out! 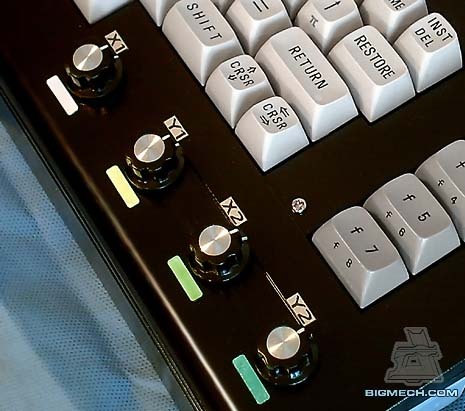 Anyway, being exposed to both these cool C64 mods within a matter of days, I have finally decided to get Prophet64. Stay tuned for my report about it later on! This page was previously hosted on http://gameboygenius.8bitcollective.com/wordpress/category/prophet64/ (*).